Neurocrine Biosciences, Inc. NBIX provided preliminary sales guidance for Ingrezza pertaining to the fourth quarter of 2018 and the full year along with an update on its pipeline candidates. Based on unaudited financial results, Neurocrine expects Ingrezza sales for the full year to be approximately $409 million, reflecting a staggering increase of 250.8% from the prior-year level. The company estimates Ingrezza for the final quarter to be approximately $130 million, which is also significantly higher than the year-earlier level. The company guided preliminary total prescriptions for Ingrezza to be approximately 22,900 and 71,500 for the fourth quarter and full year, respectively. Ingrezza is Neurocrine’s only marketed drug, which received an FDA approval in 2017. It is the first medicine approved in the United States for treating adults with tardive dyskinesia (TD). The drug is also being investigated for Tourette syndrome and has been granted an Orphan Drug Designation by the FDA for the same. Shares of Neurocrine have lost 4% in the past year, narrower than the industry’s decline of 17.8%. The company remains on track to accomplish several clinical milestones in 2019. Neurocrine has a collaboration with AbbVie Inc. ABBV for Orilissa (elagolix). Last July, the FDA approved Orilissa for managing moderate to severe endometriosis pain in women. It is marketed by AbbVie. The drug is also approved in Canada. Elagolix is also being evaluated for the treatment of uterine fibroids in women. Last August, Neurocrine and AbbVie announced positive top-line results from a study, which showed a majority of women with uterine fibroids having achieved clinical response. Data from the study will support a new drug application (NDA) for elagolix, expected to be filed this year to address uterine fibroids. Neurocrine is in the process of submitting an NDA for opicapone during the second quarter of 2019 and plans a commercial launch of the same in 2020. Another candidate in Neurocrine’s portfolio is NBI-74788, which is being evaluated in mid-stage studies for the treatment of congenital adrenal hyperplasia (CAH). The company plans to present data from a phase IIa study on NBI-74788 for treating CAH in adult patients during the first quarter of 2019. Neurocrine plans to initiate a phase IIa study on NBI-74788 for treating CAH in pediatric patients later this year. The company intends to begin a pivotal phase IIa program on NBI-74788 for attending CAH afflicted adult patients during the second half of 2019, which will back a regulatory submission for the candidate. Neurocrine also aims to file an investigational new drug submission on a newly discovered candidate and subsequently start a phase I study on the same. Neurocrine currently carries a Zacks Rank #3 (Hold). Better-ranked stocks in the same sector include BioSpecifics Technologies Corp BSTC and Hikma Pharmaceuticals Plc HKMPF, both sporting a Zacks Rank #1 (Strong Buy). You can see the complete list of today’s Zacks #1 Rank stocks here. 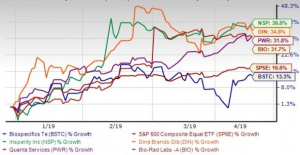 BioSpecifics’ earnings estimates have been revised 16.8% upward for 2019 over the past 60 days. The stock has soared 45.3% in the past year. Hikma’s earnings estimates have moved 6.9% north for 2019 over the past 60 days. The stock has surged 41.7% in a year. What's in Store for BioSpecifics (BSTC) This Earnings Season?